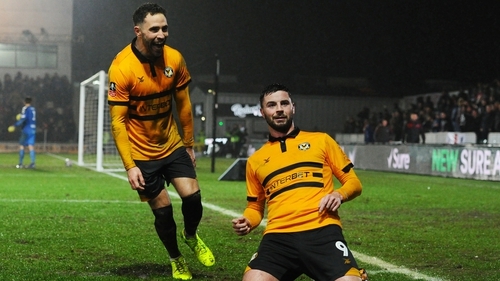 Padraig Amond has said the pressure is off Newport County as they wake up the fact they will face Manchester City in the FA Cup fifth round later this month. Amond – formerly of Sligo Rovers and Shamrock Rovers – once again rose to the occasion as he slotted home a well-worked second goal to knock out Championship outfit Middlesbrough. He told RTÉ Sport: "It was an unbelievable feeling. It was well-worked training ground routine. Sometimes in the big games you’re best opportunity will be from a set-piece so we worked really hard on them. The minute it left my foot I knew it was going into the top corner. "For that split-second before everyone else realises it you’re know what is happening and where it is going to go and it’s just a great feeling." Amond said the win was completely deserved as the League 2 outfit ensured a second giant-killing of the competition. "It wasn’t a fluke, the same as the Leicester game. We put in an unbelievable performance last night. We could have 3-0 up at half-time. "Their goalkeeper made a couple of saves and we were unlucky not be ahead earlier. Just after half-time was a great time for us to score and keep the momentum going. "From then on there was only going to be one winner and you’re obviously just really pleased we have beaten another really good side and can look forward to the next round for a daunting tie against Man City." Pep Guardiola will now bring his City side to Rodney Parade in 10 days’ time – with Newport set to take in over £1million from their success in the competition. Amond is not prepared to write off their hopes. "We’ll do everything we can. It’s going to be a tough game again but this time we are playing one of the best sides in world club football. There will be a few sleepless nights ahead of the game but we have nothing to lose. "Nobody expects us to win the game or get anything from it. The most important thing is for the club that financially the future is secured for the next few years as this run in the FA Cup brings in an amount of money. For the players we can really enjoy the build-up and all the pressure is off us. "Hopefully we can put in a performance like the last couple of rounds and you never know what can happen." As always in these tales, there are varying stories to tell, no more so than goalkeeper Joe Day dashing off at full-time as his wife was close to giving birth to twins for days. Amond confirmed that two girls had been successfully delivered to round off a great day. "Joe turned his phone off during the game and was ready to go straight away after. It shows how big a game it was for us. I’m delighted to say she has had the two girls and all is well."